Would you like to see an extra misting video for this month? One that applies to both scrapbookers and cardmakers? I know how much everyone loves crafting videos so I'm doing an extra technique video each month! There is just one little thing you need to do. Subscribe to my newsletter to see this special video. I promise to keep the mailings to a minimum - once, maybe twice per month if I have some exciting news or special on a class or PDF. I don't think any of us like to be bombarded with e-mails wanting us to buy this or that. So while my newsletter will announce and promote classes, it will mainly include content. There will be at least 1 extra tip and a video each month. So that is a great deal. All you have to do is sign up. The signup box is on the right side of my screen. Just enter an e-mail address, name (optional) and then click on Subscribe. You will be sent a test e-mail and asked to confirm. That's it! 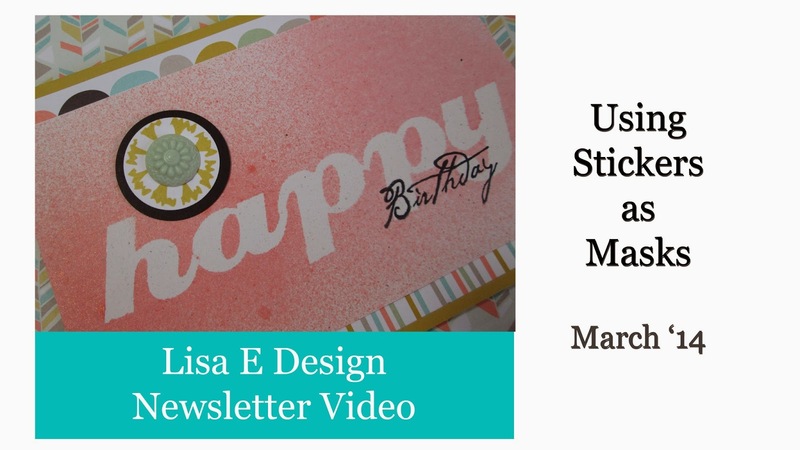 Now about that extra misting video, if you sign up, I'll be sure to forward the March newsletter so you'll have access to the video and can watch whenever you'd like. And in April, a new newsletter with exclusive video link will arrive in your inbox. Thanks for all your support of my blog and videos!